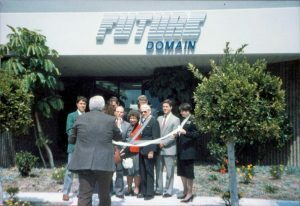 By mid-1989 we had four suites in three buildings at our Parkway Loop headquarters in Tustin. It was not an ideal situation, making coordination and communication more difficult. We were still growing and projected we would be out of space again by early 1990. So we began searching for a new facility. After a couple of months we found a 32,000 square foot building on McGaw Avenue in Irvine, just off Jamboree. This was an ideal location, close to freeways and the airport, yet not that far from our Tustin location. The building served as the Irvine City Hall before they built the New City Hall. It was owned by Olen Properties, who’s CEO was Igor Ilinicoff. After we decided to go with this building the next challenge was to get the tenant improvements done prior to our move in. We planned to move in January 1990, but there was a lot of work to do. Patty took responsibility for getting the building ready, but as usual nothing goes completely smoothly. In December Patty let me know that Olen was way behind schedule in getting the building ready. Patty and I requested a walk thru, and were surprised at what remained to be done. I called Igor and requested a meeting. At first he was somewhat dismissive and belligerent. He told Patty and I that his people said everything was OK. Patty set him straight. She had the facts, and he immediately recognized that. He got his construction supervisor on the phone and read him the riot act. The next day he called us and said he would have the building done for us to move in the beginning of February. He gave Patty his personal phone number and asked her to call him if she found anything amiss. After that progress on the building was rapid, and we moved in February 9, 1990. The building was beautiful and functional. Because our sales growth was slowing we did not really grow into the space for another two years, however we had gotten a good deal on the rent and had the capital to afford it.